Did you know that Madid is full of bewitched places? 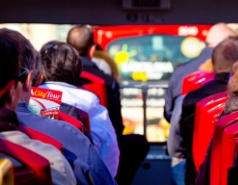 Get to know the city with the hop-on hop-off service of the open top bus tour Madrid City Tour and it´s routes Historical Madrid and Modern Madrid and live from the first hand the most famous ghost legends of the Spanish capital. 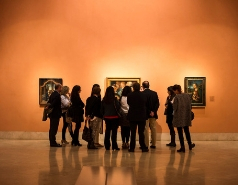 The first must to see place of the bus tour through the bewitched Madrid is the ¨Museo Nacional Centro de Arte Reina Sofía¨, bus stop nº 20 Museo Reina Sofía, of the route Historical Madrid of the tourist bus City Tour Madrid. During the years, the guards and the workers of the museum declared to have heard voices in empty rooms, the alarms have sounded without any reason, the lifts have started functioning alone and the doors have opened without man´s help. Other legend is the one of the ¨ la Casa de las Siete Chimeneas ¨ which exists from the XVI century. There was found the dead body of a young lady called Elena who was a lover of the monarch Felipe II. Elena´s body disappeared mysteriously. Strange appearings started to happen during the following years, the ghost of a women wearing white clothes was seen walking on the roof of the house. Centuries after, supernatural things continue happening. During the XIX century, it was found the dead body of a woman caring in her hand coins from the time of Felipe II. Was that the body of Elena? If you want to get to ¨la Casa de las Siete Chimeneas¨, enjoy the advantages that offers the bus tour Madrid City Tour bus and take the route Historical Madrid of the official tourist bus service and get off on the stop nº 5 Plaza de Cibeles or take the route Modern Madrid and get off on the bus stop nº 2 Plaza de Cibeles. El Palacio Real is considered one of the bewitched buildings in Madrid. The legend says that Felipe V ordered to build it in a place which was a home of fantastic creatures like witches and ghosts. When the building was finished, the king ordered to kill the architect. The voice of the murdered man can still be heard in the empty rooms of the palace. 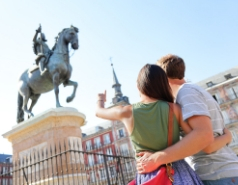 If you want to prove if the legend is true, take advantage of the guided visit in Madrid of the hop-on hop-off bus Madrid City Tour. You can take the route Historical Madrid and get off on the stop nº12 Palacio Real of the panoramic city bus.